Japan is also famous for having a lot of vending machines dispensing everything from snacks, softdrinks and beer to toys and electronics, and even shirts and underwear! 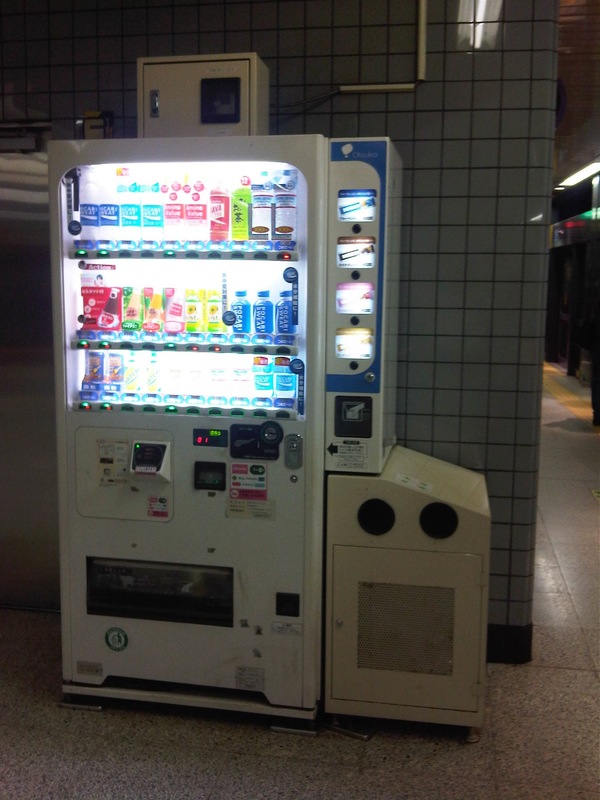 At the train stations there are also many vending machines in addition to the kiosks that are basically convenience stores. Here are a couple of vending machines and the garbage disposal bins beside them. Within the larger stations, there are also restaurants or eateries for those wanting a quick meal but happen to have already gone past the turnstiles. These are not your typical holes in the walls or fast food types. Instead there are also full service restaurants or cafes. Then there are food courts where commuters may have a good variety to choose from like the Tokyo Food Bar that I found at the JR Akihabara Station. This food bar is very much like the food courts we find at malls. These offer a variety of selections for the hungry commuter. The signboards show the menus of establishments inside the food bar. Calapan City port’s passenger terminal is a nice, modern facility though I think it is insufficient for the number of people that are now using the terminal on a daily basis. I can imagine that the terminal can be congested during the peak seasons of travel. I took a few photos inside and outside the terminal during a recent trip between Batangas and Calapan. Pre-departure area at the Calapan port passenger terminal. I was impressed with the terminal that seems better than some airport passenger terminal I’ve seen in the country. Fellow SuperCat passengers waiting for our boarding call. One needs to approach the staff at the booth near the gate in order to get a seat number. Seats on board the fast craft are designated even with few passengers making the trip. Exiting the terminal to board our vessel, we proceed along a covered pier where our SuperCat and a FastCat ferry (shown at center) are moored. The Calapan port passenger terminal as seen from the pier. Rough waters hitting the port. Shown in the photo are RORO ferries docked at the port. We rode one of these on our trip from Batangas to Calapan. The FastCat is a relatively new service between Batangas and Calapan. It can carry a few vehicles much like the conventional RORO ferries but its twin-hulled design provides stability with speed over rough waters. A friend walking along the pier between a SuperCat and a FastCat. The SuperCat is purely a passenger vessel while the FastCat can carry a few vehicles with stability provided by its twin-hulled design. Rough waters in the late afternoon – similar conditions in the morning prevented us from taking a SuperCat to Calapan as fast craft trips were suspended. The big news in Japan today seems to be the rail incident where a woman saved the life of a man who attempted suicide or fell unto the rail tracks of the JR Yokohama Line. Unfortunately, the woman died as she was ran over by the train as she apparently positioned the man in between the tracks. As far as I could understand, it seemed that the barriers for a crossing were already down and the alarms announcing the arriving train were also engaged when a man entered the danger zone and fell (or laid) at the tracks. People including pedestrians and those in their cars were shocked by the situation but only the woman who was with a companion in a car decided to act to save the man from the oncoming train. Following are photos I took from a TV news report on the incident. Footage of the crossing where the woman perished. Emergency button that was supposed to be used by people in exactly such cases but people were apparently too shocked or unfamiliar with this safety device at railway crossings. Photo of the heroine who, if I understood from the report, will be awarded posthumously for her effort to save another person. Another photo of the 40-year old woman, Murata-san. Japan takes pride in their work towards making their transport systems safe. Rail incidents have been minimized by using modern, high technology tools including sensors and monitoring systems. However, it seems that there are cases such as these where the intervention of people (including those who might be spectators of an incident) are still necessary as these are likely beyond the capabilities of even high tech countermeasures installed at rail crossings. We salute and honor this woman who was willing to help another person at the cost of her own life. She deserves the honor and recognition for this great humanitarian act. Passing along the University of the Philippines’ part of Katipunan, one will see a new development at the area where the UP Integrated School (UPIS) is currently located. The UP Town Center is being promoted as part of a university town center concept and is the second major Ayala development on UP land after the Technohub in the north side of the 493-hectare campus. The surrounding area to the newly built Town Center will most likely host business process outsourcing (BPO) including call centers that currently populate Technohub. I learned that the development’s design was reviewed on the UP side by a team that included faculty members from UP Diliman’s College of Architecture and School of Urban and Regional Planning. I assume that they were able to cover most if not all the aspects of the design for this particular development and the rest that will follow once UPIS moves to the main campus and the entire lot is developed much like into what Technohub is at present. I would assume that they provided recommendations to Ayala and that these recommendations were used to improve on potential issues with the development. However, my worry is that the transport or traffic component of the design (i.e., transport impact assessment) was not sufficient for the traffic that will be generated by the development. While Technohub had no serious problems regarding traffic as it was along the wide Commonwealth Avenue, the Town Center was located in the narrower C-5 that is the route for much private traffic as well as trucks. Let us look at the potential problems for the UP Town Center in relation to transport and traffic. For one, the development is close to a major intersection, the junction of Katipunan-CP Garcia. The current traffic signal cycle for the intersection allows for continuous through traffic for the northbound side of Katipunan. Thus, traffic in front of the development, which is along this same northbound side of C-5 will be continuous. Vehicles slowing down to enter the parking lots at either end of the building will likely slow down traffic along C-5. Meanwhile, there are no driveways or bays for transport to load/unload passengers in front of the building. Instead, the driveway is right after Katipunan-C.P. Garcia intersection and does not appear to be designed for jeepneys, taxis and cars will, instead, likely stop on the road and such will mean one lane of C-5 will be occupied, contributing to a decrease in the capacity of the roadway. Another thing is the parking. Currently, there are limited spaces as understandably the area is still being developed and the lots are temporary facilities. I presume that there will be more spaces available soon considering the parking generation characteristics of such types of developments that tend to attract car-owning people though perhaps the target is a broader range of customers. And then there are the issues regarding walking and cycling. One friend was asking if there were bicycle racks at the Town Center. I saw none (yet?) but perhaps there will be facilities for cyclists. As for walking, this section of Katipunan is more walkable compared to the segments in front of Ateneo and Miriam where cars seemed to be parked or standing everywhere and pedestrians are forced to walk on the road. Along the side of the U.P. Diliman campus, there are sidewalks where pedestrians can safely walk. On the Town Center’s side, there are also sidewalks and we hope these can still be improved once construction is at full swing. Perhaps what requires attention for both pedestrians and cyclists are crossings. With the increased traffic along C-5 due to the opening of the Luzon Avenue overpass crossing Commonwealth, it has become more dangerous to cross C-5. As such, there is a need to address such issues as surely there will be significant pedestrian traffic crossing to and from the Town Center. No driveways or bays for public transport? Construction work continues for the soon to open UP Town Center even as the fences are taken down to reveal a modern building that will host restaurants and shops. The UP Town Center is already attracting traffic as some restaurants and shops have already made “soft” openings. A colleague once made the comment that the Town Center was not really for UP but, like the Alabang Town Center, was for the posh residential subdivisions in the area. These include nearby La Vista, Loyola Grand Villas and Ayala Heights subdivisions. Also, it will likely attract more car users than public transport users as locator restaurants and shops are mainly upper-middle to upper class. There are no Jollibees, Chowkings or McDos here. For now, the developer and UP Diliman deserves to be given the benefit of the doubt in as far as the development’s design is concerned. Perhaps the issues I mentioned above will be addressed once the entire area leased to Ayala would have been fully developed. And until then, there would be opportunities to check and ascertain if the development is indeed people friendly and something that can be called a university town center and not just another commercial development that attracts traffic. Due to rough seas, there were no SuperCat trips between Batangas and Mindoro when we arrived at Batangas Port one Thursday morning. It seemed that there was only one fast ferry under the banner of SuperCat that plies the Batangas-Calapan route and it was on hold in Calapan due to rough waters. Later in the day though I would theorize that there might not have been enough passengers that morning between the cities and a decision had to be made not to make the trip, with the convenient and irrefutable reason of rough seas. A view of two RORO ferries docked at the Batangas Port. One was operated by Montenegro Lines’ Marina Ferries and the other by Starlight Ferries. Passengers boarding the ferry Reina Hosanna. Some vehicles, mostly trucks were already loaded on the ferry. Others would have to wait until passengers have boarded the vessel. A view inside the ferry where vehicle and freight are positioned and secured for the voyage. People form a line before the narrow stairway to the passenger level. Passengers climbing the narrow stairway to the passenger deck of the Reina Hosanna. A view of the Batangas Port from the upper (view) deck of the ferry right above the passenger deck. Trucks can be seen boarding (rolling on) the ferry. The orange things are lifeboats lined along the rear of the passenger deck. A provincial bus arrives to board another RORO ferry, the Starlight Nautica, which was scheduled to leave an hour after our scheduled departure. There are many bus companies plying the western nautical highway route , which can take the traveler to Caticlan, the jump off point for Boracay Island. Reina Hosanna crewmen raise anchor. A view inside the passenger deck – seats were cushioned but mostly dilapidated and obviously requiring re-upholstery. The cabin seemed to be originally air-conditioned and we were lucky that the weather was fine and not so hot that day. Some passengers went to the upper deck to get some air. Rough seas along the Verde Island passage to Calapan. We actually saw two fast craft going the opposite direction during our almost 3-hour voyage to Mindoro. One was a SuperCat and another was a FastCat, and they were traveling despite the same rough waters shown in the photo! Another ferry preparing to leave Calapan Port. Crew throwing a line to the port as our ferry docked at Calapan. Passengers disembarking from the ferry. Vans waiting for passengers bound for various destinations in Mindoro including those in Mindoro Occidental on the other side of the island.